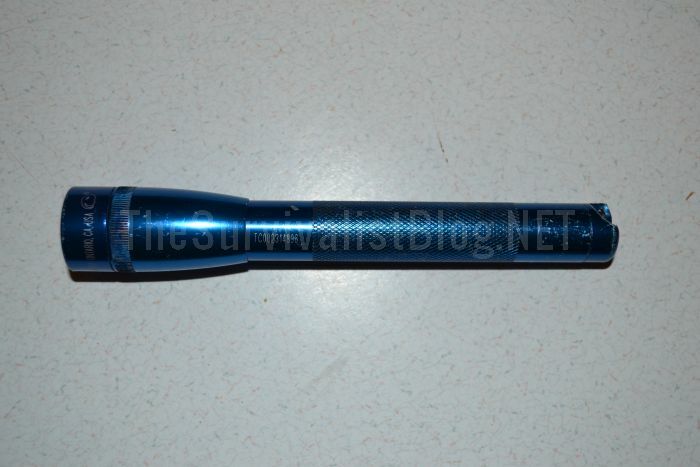 Maglite (or Mag-Lite, if you are a pedant) is one of the most recognized names in flashlights. Around since 1979, their flagship light was and remains a gigantic multi D-cell monster that was a standard tool on the belts of cops, tradesmen and other blue-collar professionals from the 80’s all the way through the 1990’s and early 2000’s. Many homeowners had a big Maglite stashed in a cabinet or junk drawer for inevitable power outages, its black aluminum tubular body and side mounted activation button enduring dings and dents that would break the cheap plastic competitors of the day. Maglite eventually branched out with a family of similar lights powered by smaller and smaller batteries, an attractive option for those who needed a sturdy light close at hand. For a long, long time Maglite was synonymous with hard-use flashlights, warts and all. But is that still the case today? High-performance flashlights are as common as Coke across the globe, and the competition among their makers for consumers is ferocious, as is their unending quest for greater brightness, longer battery life and improved durability. Has Maglite kept pace with the new paradigms of light design and performance? Or are they an obsolescent holdout from their glory days? In this article we will try to answer that question for prospective light buyers. 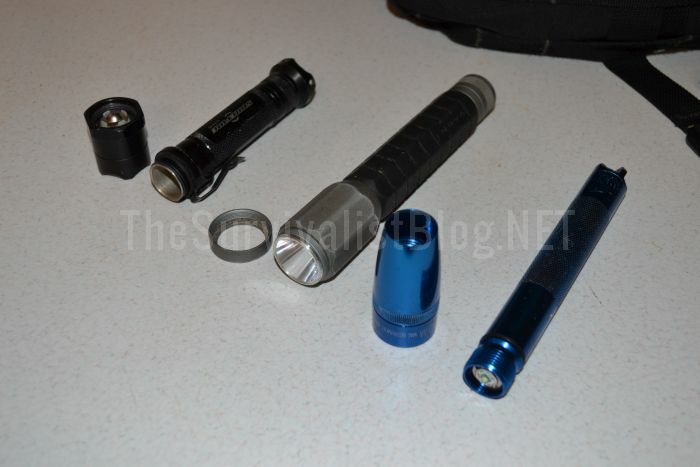 The stereotypical Maglite as most consumers know it is a very large, heavy tube shaped light made from aluminum and using either D- or C-cell batteries. Originally incandescent they have since made the switch to LED light sources long after they became the industry standard, though incandescent models are still available. They feature twist-adjustable focusing at the bezel and a side mounted activation switch near the head. Batteries are inserted or removed via a thread off cap at the tail of the light. The other most common modes are a much smaller and lighter AA- or AAA- cell unit with the same essential features except that the activation and focusing is accomplished by twisting the head, which is generally regarded as inferior to a dedicated switch for the same purpose. One unique feature of Maglites that is rare among other lights is a “candle” mode, where the protective lens and bezel of the flashlight is removed, exposing the LED or bulb, and then used as a base for the light. This produces an all around light source but does make the bulb/LED vulnerable to damage. Large Maglites were rightly famous for their general sturdiness in their prime, but were commonly derided for their bulk and weight. This flaw belied a commonly exploited perk: a large Maglite loaded with D batteries is very heavy, and makes for a formidable impact weapon nearly the equal of a purpose-built club or baton, an unadvertised function commonly employed by police, security and bouncers. Aside from the aforementioned switch to LED, Maglites have changed very little since their inception, and it is this dogged refusal to make serious changes or alterations to their core product that has endeared them to some flashlight enthusiasts while aggravating candlepower connoisseurs. 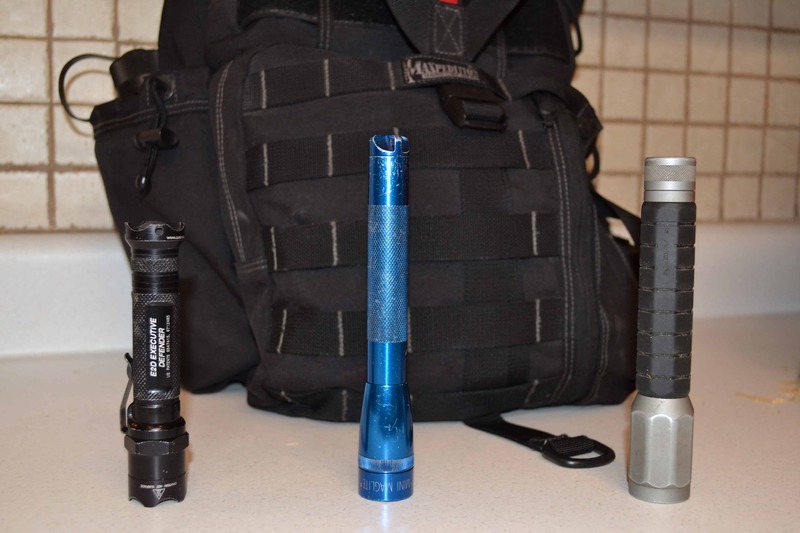 Compared to the Maglite in any of its guises, the modern flashlight offered by such competing companies as Surefire, Streamlight, Olight, Fenix and Nitecore among many others are typified by a few salient characteristics inherent to the modern breed of hard-use, high-quality lights. All will be of more or less compact size, easily carried in the hand or in the front pocket of a pair of jeans. They are constructed from strong, light aluminum alloy or from one of several blends of high-impact plastics. All will utilize high-output LED assemblies mated to excellent circuitry to regulate power consumption for optimum life and sustained brightness. Switching is most often a tailcap, but sometimes a rocker or tandem switch. 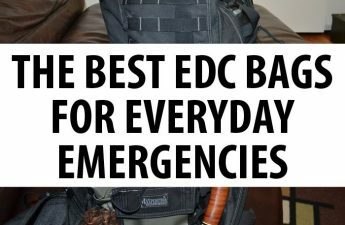 Many are designed to be used in conjunction with or even mounted to a firearm for defensive use. The most common feature by far shared among all the flashlight diaspora is the use of energy-dense CR123 lithium batteries, the employment of which made lights of this type possible. These modern lights, at most price points, offer an exceptional combination of range, output, runtime and really incredible ruggedness, with most higher-end examples being highly water resistant to boot. Pricing ranges from $20 or $30 dollars all the way up to as much as you want to spend, with Surefire being the paradigm for super heavy-duty hard use lighting tools. Some modern lights sized closer to the classic big-bore Maglite have more in common with a helicopter’s searchlight than a flashlight as far as reach and output are concerned, and are not truly fair comparisons (or even practical tools) for most users. Any modern flashlight, especially one designed to be used in harsh conditions and endure some abuse, should have the following design characteristics: it should be rugged, capable of withstanding sharp impacts from drops and other hard knocks. It should use common, energy-dense batteries that are capable of fueling the light for a long period of time. While output requirements are dependent on the task at hand, more light is almost always better as more light gives you more options and allows you to take in information (see) that much better, especially at a distance. The ability to focus a light, while seen as a perk by some, is more of a hindrance for most than a benefit: a light that is optimized from the factory will be prefocused and feature an intense, bright patch of light, a “hotspot” at the center of the beam with that surrounded by a softer spill of light called the “corona”. Lights that have user-adjustable focusing typically feature it to make up for suboptimal reflectors and lenses that permit an uneven pattern of light at any range, one full of dark spots and uneven brightness. Focusing can ameliorate these issues, but only at a specific distance, just like focusing the lens of a telescope or camera resolves a blurry image into a clear one, but only at a specific range. A few quality lights feature focusing that is designed to shift the light pattern from an intense spot beam to a broad flood beam by throwing a lever or rotating the bezel. Lights of this nature are usually carefully calibrated at the factory to maintain an even, shadow-free pattern at all times. Another good feature to look for in a flashlight is water resistance, or even proper waterproofing. 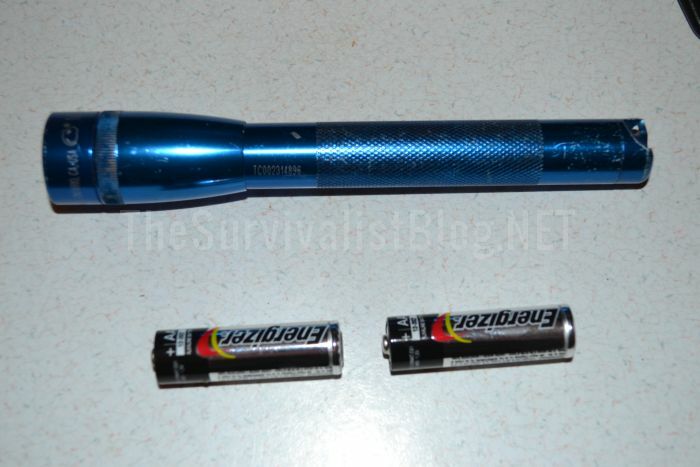 A flashlight may be called on in times of rain or storm or even in flooded conditions, natural or man-made. Some lights will only be good against incidental water intrusion, but not submersion. Others may have the water resistance to survive a drop in a shallow puddle for a moment but no deeper or not for a long time. Lights that lack water resistance can be easily destroyed or rendered inoperable by contact with water. How Does Maglite Stack Up Today? Maglites frankly made a huge mistake in the wake of encroaching LED dominance in the flashlight industry. While makers old and new were racing to take advantage of the LED’s brightness, ruggedness and versatility, Maglite was staid in their adherence to the old way: they were very, very slow in adopting LED tech, and when they did their initial offerings were a joke compared to the refined designs of competitors, especially at their price point. Maglite today is about 10 years behind equivalent companies like Olight and Streamlight in areas of brightness, runtime and user-interface. Even using LED’s, they have done nothing to their flagship lights of note when it comes to switching and additional features: the big boys still have a single side-mounted switch, while their smaller cousins use the twist-on-twist-off and focusing as they have for years with only a handful of models employing the now standard tailcap switching. Furthermore my experience with the twist-on models has been spotty, mostly related to glitch activation and mode switching. Perhaps the biggest flaw with LED Maglites is poor power regulation resulting in precipitously declining output as batteries drain. Other manufacturers take pains to down-step or even nominally stage this loss of output, but with the classic Maglites they will steadily gutter out like a candle on its last leg of wax. True, they do make some lights with “comparable” feature sets next to the current market leaders, like multi-mode lights (high, low, and SOS/pulse) but activating these options is usually a frustrating experience, especially with the twist-on models. Most still use D, C or AA batteries while others are rechargeable and feature a special 18650 battery pack. Sadly, theirs is a proprietary version that does not attain the peak output of standard versions. Maglite stacks up fairly well in the durability department, but physical durability is only part of the puzzle for ruggedness: their lights lack the extreme reliability of quality competitors lights, with many of them only advertising a drop resistance of 1 meter, about 3 feet. 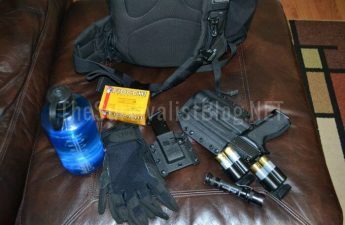 I have personally wrecked several LED Maglites over the years from modest drops that my Surefire and Streamlights would, and have, laughed off with only a blemish on the barrel or lens. Water resistance too is very poor, and stories abound of Maglites dropped into water that completely drenched the interior of the light. Part of this equation is inferior o-rings, compartmentalizing and sealing. The other part is the fine threading featured on most Maglites makes them vulnerable to coming loose, if only slightly, unbeknownst to the user. And, not for nothing, the prices of Maglites are high for their feature set and performance, though their overall build quality is pretty good. One can handily get a mid-grade light with double or triple the performance for the same price or less. Compared to a Surefire or other top-tier light a Maglite is common, readily available and far cheaper, but will not hold a candle (heh) to those gloriously expensive torches. So, we are left with heavy, bulky, outmatched, and (somewhat) overpriced lights for what you get in return. Is there anything good about Maglites today? 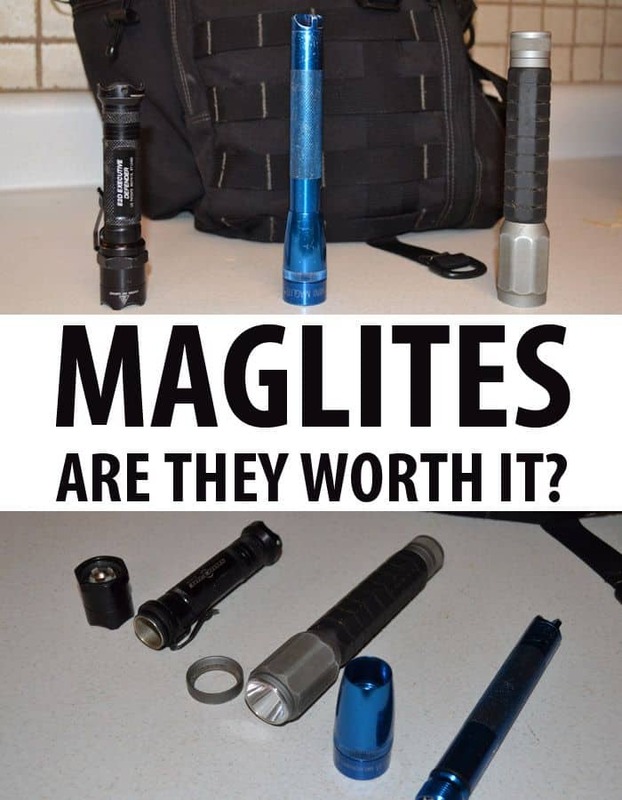 Is there a reason why a prepper or rugged individualist would choose a Maglite over another brand? 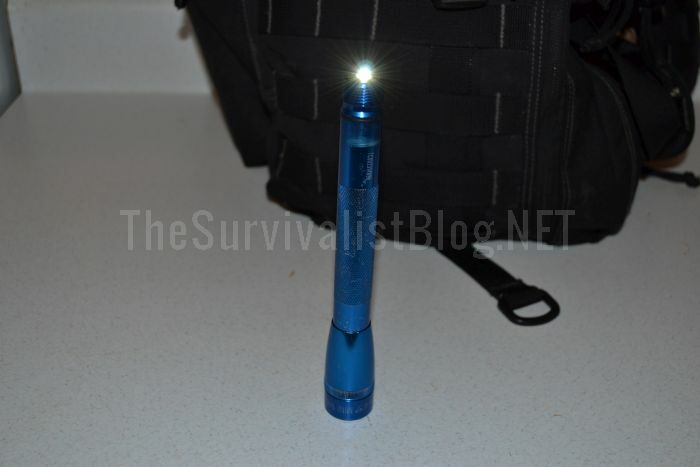 In spite of all their flaws, a Maglite flashlight may still be an entirely adequate option for general preparedness though I would strenuously not recommend one for any sort of tactical or defensive use. Maglites are available almost anywhere, typically utilize standard and inexpensive batteries and are generally robust compared to a true cheapy, plastic-bodied light. While they are not industry leaders in any category save perhaps availability, Maglites are sufficiently bright, sufficiently tough, and modestly priced. This plain vanilla appeal may be attractive to users who are looking to grab a bushel of standardized lights in one go to outfit their family or survival group. Add to your cart a few boxes of common and inexpensive alkaline batteries and you are ready to chase away the darkness. While very large and heavy, a D-cell Maglite in any configuration is a potent improvised club, with the 4 and 5 cell models having more shared DNA with a medieval mace that just so happens to light up before cracking a skull! I cannot recommend them outright due to their weight and bulk, but if one were concerned about maintaining a very low profile or lived in an area that staunchly regulated civilian ownership of weapons, one of these hefty boys may be just the ticket. Another perk for preppers who like to improve and tinker is that Maglites lend themselves very well to modification and enhancement. An entire cottage industry has popped up in the wake of the plodding Maglite company to help dedicated and die-hard users buff their lights with LED and lens upgrades, battery pack conversions and more. A hot-rodded Maglite is more than capable of matching many other modern lights in output and runtime though a roll-your-own solution will be as or more expensive than just buying a better light to begin with. All in all, they are not the lightest, brightest, strongest or longest running, but they are still a fairly solid light all around. You can do far worse if you have your mind set on one of these classic lights. Unless you are completely married to the idea of avoiding CR123 lithium batteries, I do not recommend Maglites even for general purpose lighting solutions. There are simply too many other solid, better performing lights at the same price point (and in much smaller, lighter envelopes) for me to consider or recommend one of these throwbacks. For use with a pistol or other firearm, the switching of all but a few of their specialty models makes these a hard pass. There is nothing truly deficient about them on the surface, but the warts only start to appear in comparison to the rest of the market. Bottom Line: Overpriced in category, underperforming. Spend your shekels elsewhere. Maglite is household name in the flashlight category, but just like Kodak and RC Cola, they are a shadow of their former prominence. Nevertheless, Maglite is a contender for your lighting dollars, and so long as you lower your expectations you can expect them to give reasonably dependable service. I used to carry rechargeable Mag-lites while on the job. They were pretty good lights, bright and sturdy. Yes, I used them to smack a few recalcitrant criminals in my day, once in the head which produced a nasty laceration needing about 15-sutures. I also caught a written reprimand in my file for it too. No more hitting people in the head for me. I also used them to break open car windows several times, once for a rescue, the others to get at recalcitrant criminals. However, side window glass tears up the aluminum the lights are made from. I switched to Mag-lites after a 4 d-cell Streamlight I was using had it’s head, reflector, and bulb broken when I hit a Newfoundlander dog in the head while it was trying to eat me for supper after it’s recalcitrant owner sicced him on me. The dog quit attacking and he seemed to make out physically better than my flashlight did. Owner went to people jail, dog went to doggie jail. Luckily it was winter in Michigan and I had a heavy police coat on, otherwise the dog would have gotten his pound of flesh too. In general, I liked my Mag-lites. But they were at the top of the heap in those days. These days, hitting people with heavy flashlights is generally frowned upon in police work. Were I still on the job, I would probably have something smaller and lighter, with LED bulbs and CR123 batteries. My interest would be a reliable bright light, not an impact weapon. Pepper spray and Tasers help fill the void. I carried a 3 d-cell light when doing security. I have multiple AA lights. I really like the “candle” feature. I discoved it in the 80’s, in the military tactical unit. It works great taped or clamped to the pole in a tent. I have always been diehard maglight. I dis like multiple settings on flashlights. I want to pull it out and switch it on to full brightness. After 2 different maglight 2aa led lights have failed on me I went to streamlight. It has multiple settings but when you first turn it on it is always on max and you must cycle through the button to for low ect. I am okay with that. The streamlight hasn’t let me down yet in 2 years like the 2 maglight leds did. I use my flashlights at least once a day. I don’t mind using the cr123 batteries that are more expensive for a light that is brighter with better made internals. Never had a maglite fail me. Brightest, no. Best options, no. Always work when needed. I recently bought a surefire. Always wanted one didn’t want to spend the money. Nice light but the problem is that it goes into low lumen mode very quickly. Need lots and lots of batteries to feed it. There is something to be said for old school.